Start your cover letter by clearly indicating your name and address. In the current times phone numbers and email addresses are more valuable than postal addresses. Remember to indicate the date right after your details. On the left side of your cover letter indicate the name of the receiver of your cover letter. In most cases it is the Human resources department but then sometimes companies offer different addresses, pay attention. Provide the proper salutation and since most of the time you might not know who will be reading your letter use the common “Dear Sir/Madam” phrase. The subject line of your letter should clearly indicate the position applied for, if the company provided a unique job code in their advertisement, be sure to use it. In your first paragraph illustrate the reason for writing and why you feel you are the correct match. The second paragraph of your cover letter should be based on convincing the reader as to why they should hire you by giving a more detailed description of your job matching skills. Conclude your cover letter by indicating your availability on short notice for an interview. Remember to thank the receiver for their time. Wrap up your cover letter with your full names and a signature. 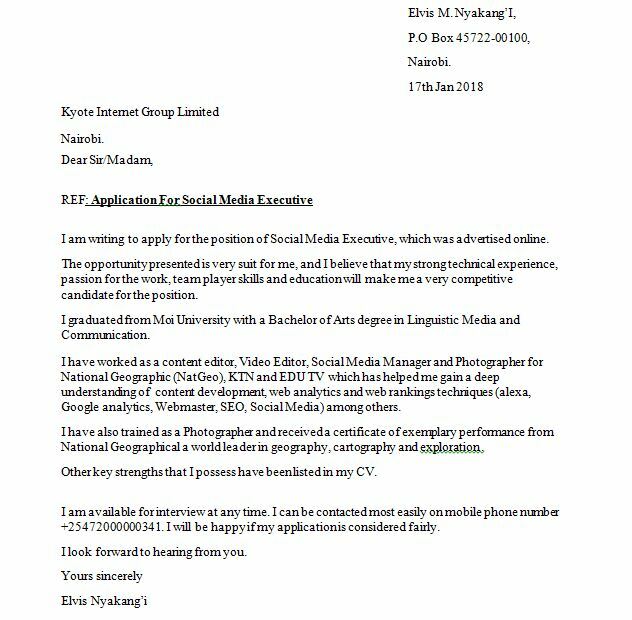 I am writing to apply for the position of Social Media Executive, which was advertised in indeed.com. The opportunity presented is very suit for me, and I believe that my strong technical experience, passion for the work, team player skills and education will make me a very competitive candidate for the position. I graduated from Moi University with a Bachelor of Arts degree in Linguistic Media and Communication. I have worked as a content editor, Video Editor, Social Media Manager and Photographer for National Geographic (NatGeo), KTN and EDU TV which has helped me gain a deep understanding of content development, web analytics and web rankings techniques (alexa, Google analytics, Webmaster, SEO, Social Media) among others. I have also trained as a Photographer and received a certificate of exemplary performance from National Geographical a world leader in geography, cartography and exploration . Other key strengths that I possess have been listed in my CV. I am available for interview at any time. I can be contacted most easily on mobile phone number +25472000000341. I will be happy if my application is considered fairly.